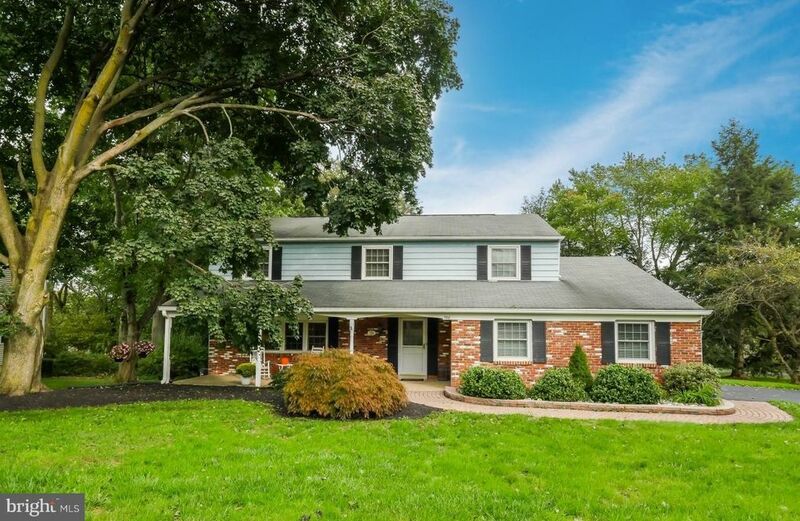 Located in a quiet neighborhood with sidewalk-lined streets you will find this lovely home situated on a large lot within the award winning Pennsbury School District. With the character of brick accenting a long covered sitting porch you come inside to be greeted by a spacious foyer. The formal living room offers a long bank of windows and allows for varied furniture arrangements as the wide entry to the dining room provides an easy flow for entertaining. The green backyard views are taken in while dining as the two-tone appeal adds an element of elegance accented by chair rail molding. With a large breakfast room including a built-in desk area the kitchen is designed as the heart of the home. The peninsula island and cabinetry present a classic contrast of white and dark that is warmed by the hardwood-look floors. Step down to the family room where a full wall of brick frames the fireplace, the exposed beams and long built-in adds an ambiance of charm and two skylights bring in a soft infusion of natural light. The exterior door leads to the paver patio, while a few steps away you have a remodeled powder room, laundry room w/cabinets and laundry tub, and the entrance to the spacious side entry two-car garage. The upper level hosts four bedrooms and two remodeled full baths. The owner's suite features a generously sized bedroom with soft, serene appeal, a customized walk in closet and recently updated private bath including a wide step-in shower enclosed with sliding glass doors. Three additional bedrooms are all nicely sized and have ample closet space. A sizeable common bath is highlighted by wainscoting, marble vanity and tiled tub with shower area. An expansive, tiered paver patio creates a beautiful outdoor living area to enjoy the peaceful oasis style backyard with a variety of indigenous trees that will create a colorful autumn display. Just minutes from the township recreation area and pool, and the historic district of Yardley, this well-cared for home is simply awaiting your arrival.